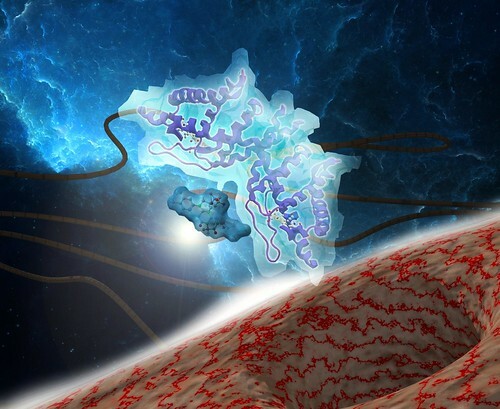 Illustration of the PNNL team's technology where a vitamin mimic (small blue structure) binds to a protein (larger coiled structure) to gain entry into the bacterium Chloroflexus aurantiacus. Chloroflexus aurantiacus under the microscope. RICHLAND, Wash. — Microbes need their vitamins just like people do. Vitamins help keep both organisms healthy and energetic by enabling proteins to do their work. For bacteria, a dearth of vitamins can spell death. Now scientists at the Department of Energy's Pacific Northwest National Laboratory have made a "vitamin mimic" — a molecule that looks and acts just like the natural vitamin to bacteria, but can be tracked and measured by scientists in live cells. The research offers a new window into the inner workings of living microbes that are crucial to the world's energy future, wielding great influence in the planet's carbon and nutrient cycle and serving as actors in the creation of new fuels. "We have a lot to learn about how microbes accumulate and use nutrients that are necessary for their survival and growth. This provides a window for doing so," said chemist Aaron Wright, the corresponding author of the study published in ACS Chemical Biology. "Perhaps we will be able to make a microbial community do what we want, by controlling its access to a specific nutrient," Wright added. It's the same for scientists trying to understand microbial cells. While a cell is infinitesimally small, the activity within resembles the hustle and bustle of a large city, with many functions within carried out by thousands of entities. Knowing precisely which vitamins aid which proteins, under what circumstances, to keep things running is a must if scientists are to maximize microorganisms for energy production and other processes. "Microbial communities are organized based on their ability to get the resources they need to survive and grow," said Wright. "We need to understand how the availability of nutrients, like vitamins, helps determine the structure of a microbial community as a step toward controlling that community in ways we would like to be able to do." 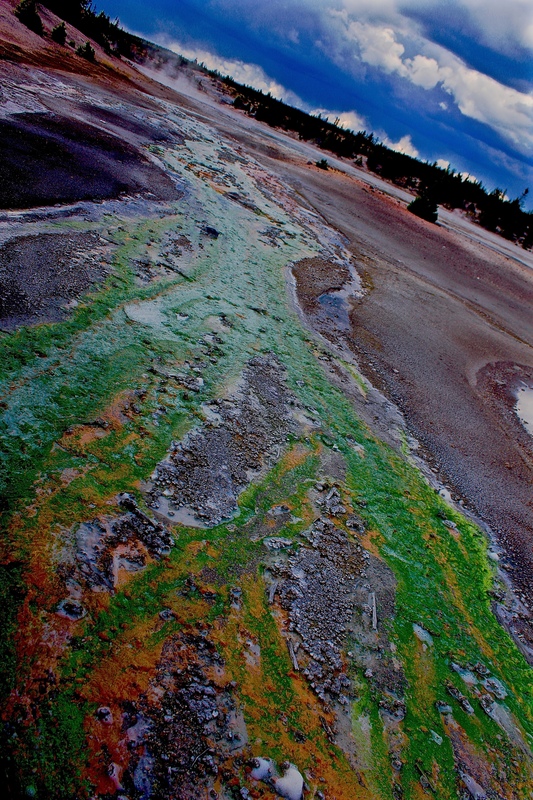 Wright's team studied the bacterium Chloroflexus aurantiacus J-10-fl, which is a common member of microbial mats — gloopy natural structures (think pond scum) where layers containing different groups of microbes band together. In these collections, C. aurantiacus often plays the role of anchor, helping to hold together an assortment of microbes. 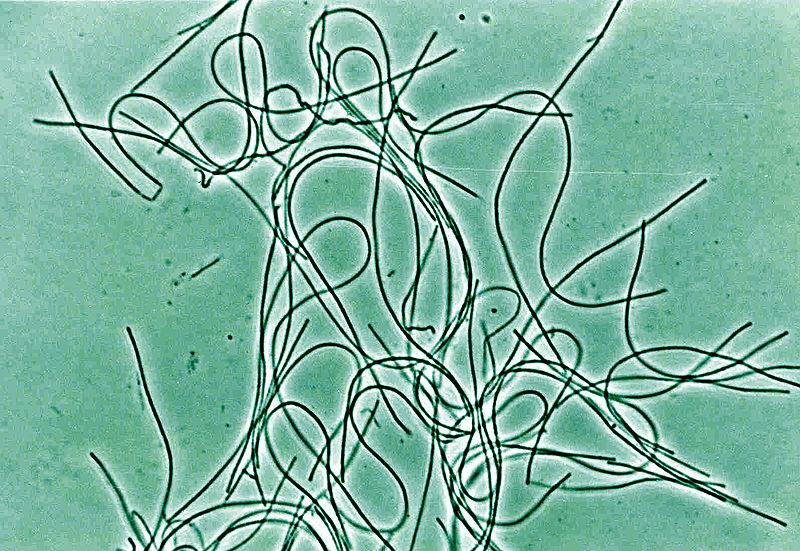 The bacteria, which resemble strands of string under the microscope, are usually found in hot springs, since they enjoy temperatures above 100 degrees Fahrenheit. Wright's team performed a series of synthetic chemical steps to alter three vitamins that C. aurantiacus needs to survive: vitamin B1 (thiamine), vitamin B2 (riboflavin), and vitamin B7 (biotin). While the bacteria recognized the substances as normal vitamins, the researchers can monitor the mimics much more easily than their natural counterparts. Wright's team used the mimics to relay a treasure trove of information about how vitamins enter the cell and interact within the cell, by analyzing the precise location of the molecules' activity in living cells. Through a system called affinity-based protein profiling, Wright's group effectively tagged these molecules where they're active, then used techniques such as mass spectrometry to sort and measure proteins of interest. One of the team's findings suggests multiple vitamins may share the same molecular machinery to gain entry into the cell. The team is still investigating these data. These findings can provide a road map for scientists like Wright who are trying to direct microbes as part of broad efforts to create clean, renewable fuels and reduce the effects of climate change.